July 2016 Sagittarius Horoscope forecasts that the house of career will become stronger towards the end of the month with the entry of planet Mars. Domestic issues are in the background as planetary aspects are not benevolent. Sagittarians can pay attention to business now and home and emotional matters can rest for a while. In July 2016, the Archers will need to develop more social contacts and adapt themselves to changes faster if they want to attain their goals. Planetary positions are beneficial for traveling and enhancing your knowledge through advanced studies. Spirituality and religious studies will attract the Sagittarius zodiac sign’s interest during the month. Career planet Mercury will make career issues more complex for the Sagittarians in July 2016. Mars will make you more aggressive but you have to be careful in your actions. The July 2016 monthly predictions for Pisces warn that business opportunities should be scrutinized thoroughly before accepting them. Career development is excellent and can be boosted further by socializing with clients. The July 2016 Pisces horoscope predicts that you will create more wealth during the month. You will have enough earnings to match your expenses. Money will come from overseas projects and educational ventures. Your spotlight on wealth creation will not leave any time for personal pleasures. Sagittarius, you will have the support of your spouse and friends in your monetary ventures. You may get into a profitable business partnership. It will be prudent to cut down your expenses in July 2016 and concentrate on saving for the future. In July 2016, situation on the love front is hazy for the Sagittarians. Planetary relationships are not helpful. You should make an appraisal of the existing relationships and take necessary steps to improve them. Single can have romantic opportunities at the workplace with co-workers or superiors. Love will be more passionate after July 10th. Sexual satisfaction for Sagittarius will be important in your relationships. There are less chances for pregnancy this month. 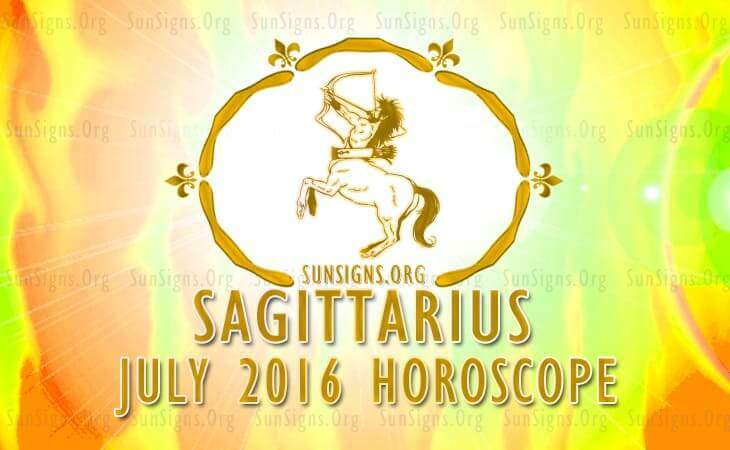 The Sagittarius health is wonderful in July 2016. Body massages and healthy diet will improve your physical fitness. Take a look at the health benefits of these foods and lifestyle activities. To conclude, the Sagittarius July 2016 astrology forecasts suggest a month that is important professionally and financially.